As if this wasn't a hard enough week already, one of the last great lights of Hollywood's golden age has gone dark with the passing of Lauren Bacall yesterday at age 89. When I really began appreciating classic movies and first caught sight of her, it was hard not to be floored by her screen presence, with that low, seductive voice and that cool gaze that always made it appear that she was aware of some sly joke none of us could catch onto. Those intoxicating looks earned her a career as a model and a spot on the cover of Harper Bazaar, where she'd catch the attention of director Howard Hawks. They would follow that with Dark Passage, with Bacall as an artist who aids Bogart's escape convict and then Key Largo, where she and Bogart would face off against a gang of criminals, led by Edward G. Robinson's smug gangster. 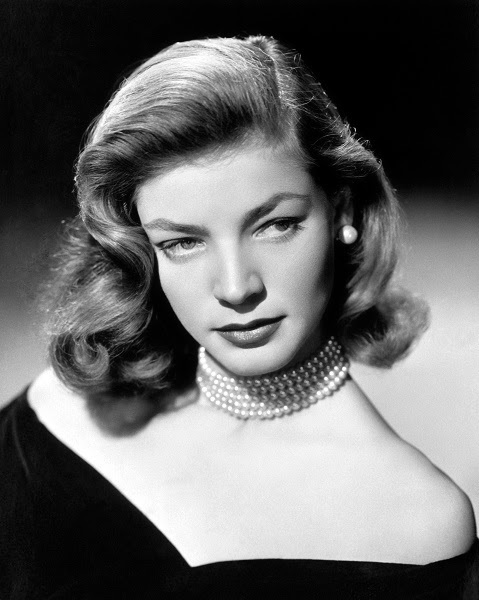 In all these movies, Bacall distinguished herself from other actresses of the period with her cool-headed persona. No matter the situation, Bacall never felt like a damsel in distress but rather a steely participant in the drama. Despite their twenty-five year age difference, they remained one of Hollywood's most successful couples right up to Bogart's death. She would have two children with Bogart and later married actor Jason Robards, with their son Sam Robards following them into acting. She would appear alongside other leading men such as Kirk Douglas as a jazz musician caught in a combustible relationship with Bacall's chilly would-be psychiatrist in Young Man With a Horn and Robert Stack in Douglas Sirk's Written on the Wind, where she played a secretary who marries into a dysfunctional Texas oil family. She was adept in comedy as well, as demonstrated by her team-up with Marilyn Monroe and Betty Grable as well-organized gold-diggers in How to Marry a Millionaire. She would also appear in Harper alongside Paul Newman and was one of the distinguished cast in Murder on the Orient Express. Moving into the 1990s, she brought class to a small role as James Caan's concerned literary agent in Misery and would receive an Oscar nomination for her performance as Barbara Streisand's oppressive mother in The Mirror Has Two Faces. Though she missed out on the award that year, she received an honorary Oscar in 2009. An unabashed liberal, Bacall was a member of the Committee for the First Amendment formed in opposition to the House Un-American Activities Committee and protested McCarthyism tactics alongside Bogart. She also campaigned in support of Democratic political candidates such as Adlai Stevenson and Robert Kennedy and supported political reformer Russell Hemenway's National Committee for an Effective Congress to promote legislative progressivism. It's inevitable but still regrettable to watch as the cinematic legends that have shaped the medium disappear one by one. Bacall negotiated a sixty-year career in Hollywood with unparalleled class and dignity and embodied the kind of poise and glamour we just don't see in movie stars anymore.